Being the caregiver for a loved one is an immense, and sometimes overwhelming, job. No two caregivers have identical experiences. One might have to manage the household finances and take care of the kids, while another might have to also help his or her loved one with everything from bathing to eating. Military caregivers are those who care for a veteran or service member, and they typically face some unique challenges. All caregivers share some similarities. Dictionary.com defines a caregiver as “a person who cares for someone who is sick or disabled,” but this doesn’t begin to encompass the job of a caregiver. Typical duties of a caregiver may include medication management, medical appointment coordination, transportation, and help with bathing, using the toilet, dressing, and eating. Indeed, according to the Family Caregiving Alliance, three out of five caregivers reported that they had fair or poor health, one or more chronic conditions, or a disability. This is significantly higher than the one out of three non-caregivers that reported the same. 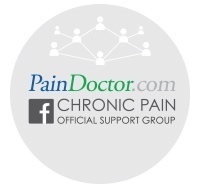 Additionally, chronic conditions like heart disease, cancer, diabetes, or arthritis were reported by caregivers at almost twice the rate of non-caregivers. Post-9/11 military caregivers face some additional challenges. The RAND Corporation, a nonprofit research organization, has identified several differences between military caregivers for pre-9/11 and post-9/11 veterans. One big difference is that pre-9/11 veterans’ caregivers are most commonly the veteran’s child; just 11% of these caregivers are under age 30. Caregivers for post-9/11 veterans are typically the veteran’s spouse; 37% of these caregivers are under 30. 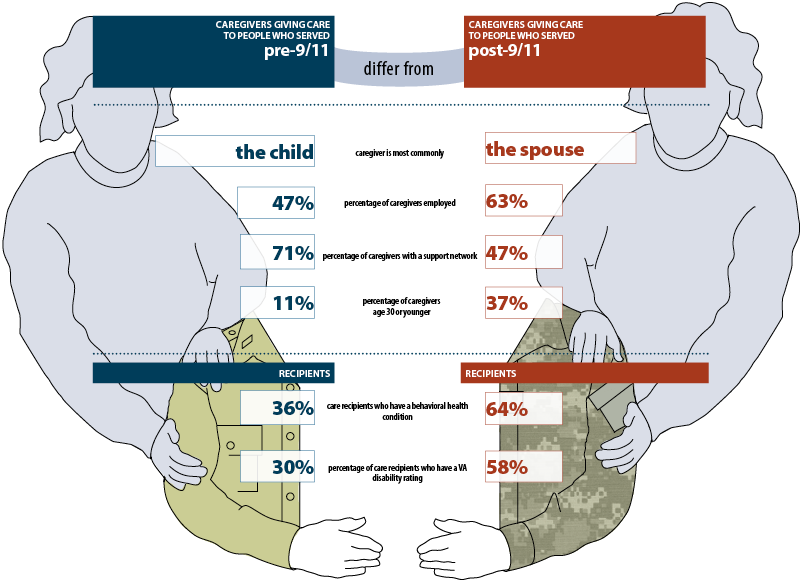 Several of the problems that post-9/11 military caregivers face are related to this difference in age. For example, a post-9/11 military caregiver is much more likely to have an outside job in addition to caregiving duties. However, because taking care of a loved one can be time-consuming and stressful, many caregivers are unable to hold down a job and, as a result, are without personal healthcare and have a very difficult time making ends meet. Also, the issues that plague the different generations of veterans are very different. Pre-9/11 veterans who require caregivers often suffer from conditions like heart failure, diabetes, Alzheimer’s, or other concerns that come with aging. These are the veterans who need help with the traditional caregiver duties like hygiene, mobility, or medication management. Post-9/11 veterans, however, often struggle with depression or post-traumatic stress disorder (PTSD), which adds to the potential risks for these caregivers. Even the Gulf War Syndrome, a chronic condition with varying symptoms that afflicted veterans of the Gulf War in the early 1990’s, seems to be making a reappearance among post-9/11 veterans. According to an article by the RAND Corporation, caregivers assisting post-9/11 veterans have four times the risk of depression than non-caregivers have. Although most caregiver support programs focus on non-military caregivers, an increasing amount of attention is being given to military caregivers. Right now, the majority of programs that offer support to military caregivers only do so by association. 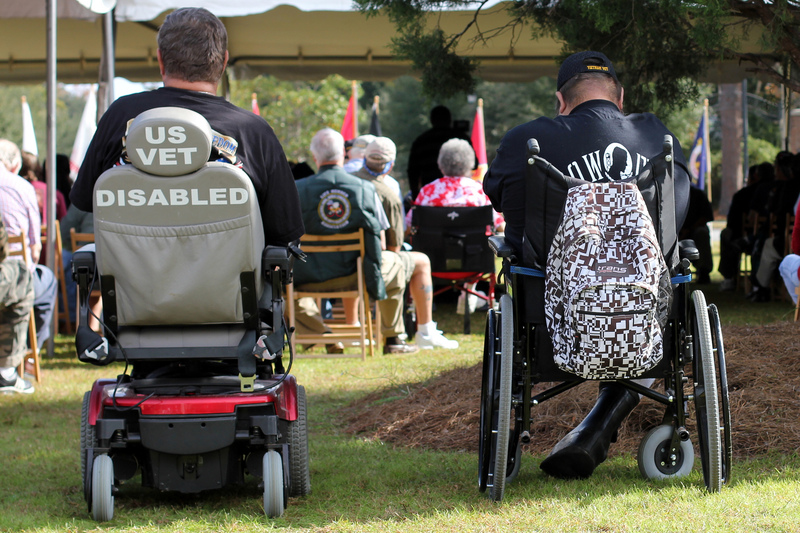 These programs focus mainly on veterans while inviting families to participate, so any services or assistance offered to military caregivers is only done by extension. However, this is changing. New support systems for military caregivers are coming to the forefront. A few of the resources provided by an RCC’s plan include counseling, benefits, employment, childcare, and organizations that modify homes and vehicles for disability access. If a Marine must transition from active service member to veteran, an RCC will be there to help the Marine and his or her family carry out the transition as smoothly as possible. The U.S. Department of Veteran Affairs has also established the VA Caregiver Support website. Being a military caregiver can encourage feelings of isolation, but some organizations are working to ease these feelings. The foundation works directly with military caregivers to find out what they need and give them a public voice. April of 2014 saw the first Month of the Military Caregiver, when military caregivers were recognized and honored. Additionally, the foundation’s National Coalition provides different ways of empowering military caregivers. Online caregiving educational seminars, a peer-support network, and a job-creating initiative are all elements of military caregivers’ empowerment. Acting as caregiver to a loved one is an immense undertaking. It can easily drain all stores of energy and enthusiasm, create feelings of total isolation, and seriously damage an individual’s financial, mental, and physical well-being. New attention, however, is sparking the creation of support groups and resources to ease the burden of military caregivers. Do you know someone who cares for a veteran?